Davey loves a party. 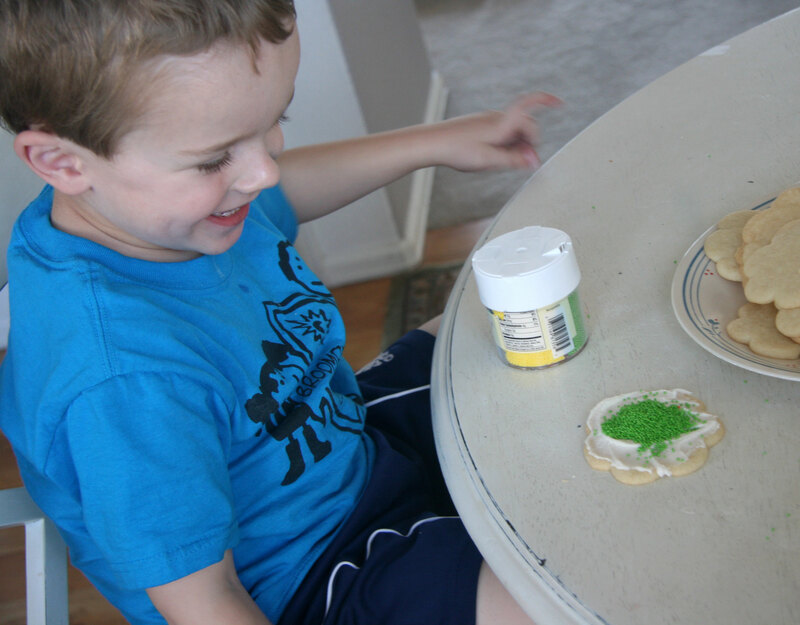 So yesterday, he didn’t want to wear green, (“little kids don’t have to wear green”) but he wanted to make cookies and have cupcakes. We ended up buying some cupcakes because I have not mastered the high altitude cupcake yet, and we made cookies. 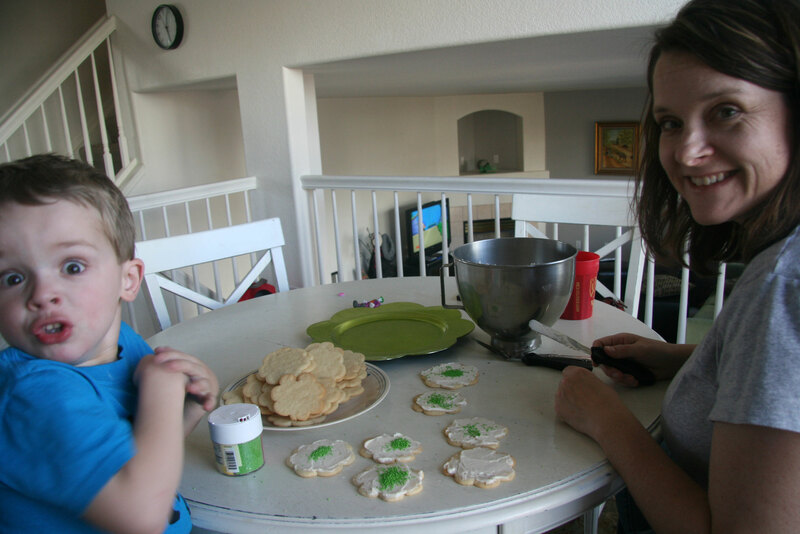 Hobby Lobby didn’t have shamrock cookies cutters so we went with kind of a flowery shape. It worked just fine – as long as Davey was doing the cookie cutting. I was having difficulty, but Davey had a technique that worked much better than mine (I have limited experience with cookie cutters. I never make sugar cookies with icing because I have no self control when it comes to that type of cookie). So Davey was in charge of wielding the cookie cutter. I didn’t buy the best jar of sprinkles. They came out too fast and were difficult to apply evenly. Davey found this hilarious. I love this next photo. David told us to smile nice for the camera. I guess Davey didn’t feel like it at the moment. Or it was when David was saying he wanted a cookie, and Davey was informing him that he had to “WAIT FOR THE PARTY! “I find this picture hilarious because it shows Davey when he is being totally tootsville. Ree Drummond from the Pioneer Woman is going to be here next weekend for a book signing. Davey loves watching her cooking show with me. He likes to see her kids on there. I’m hoping we can go. I think he’d find that really cool. And finally a cookie close-up shot. These are just too fun. 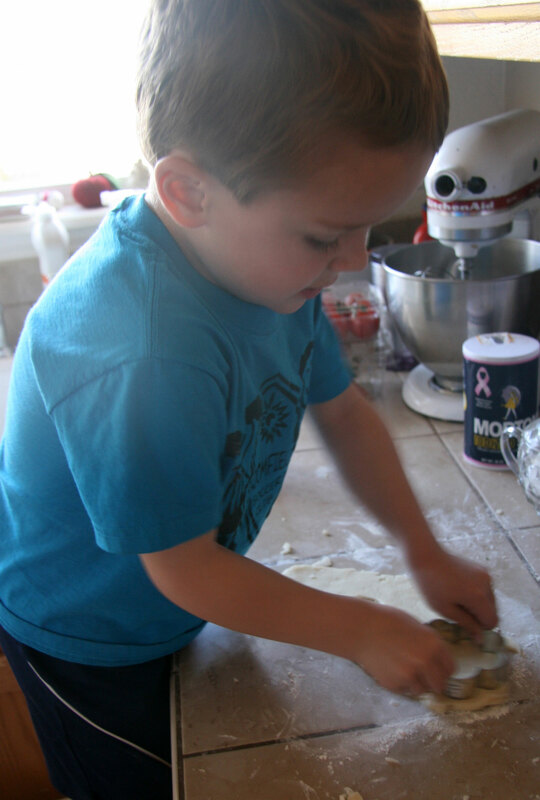 This entry was posted in Family and tagged pioneer woman by cpeezers. Bookmark the permalink. Cute cookies! I’ve never had too much luck when making sugar cookies. 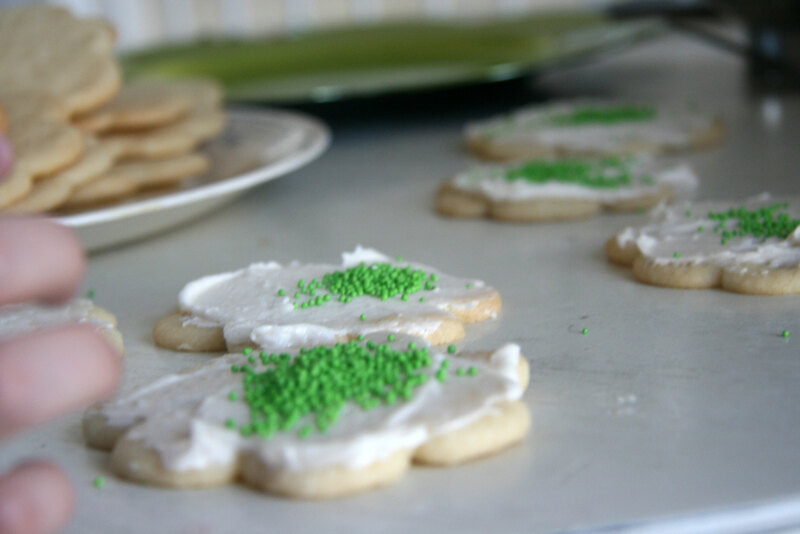 One of my goals this year is to learn to make & decorate seasonal sugar cookies. I’ve pinned many ideas on Pinterest. I think I’m real hungry for one of those cookies! You can NEVER have too many sprinkles. Tell Davey — GOOD JOB!